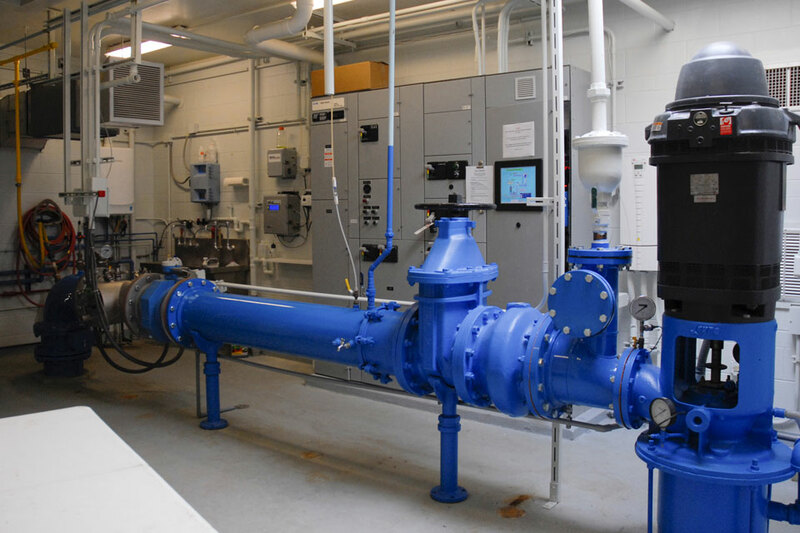 A 12 inch ultraviolet treatment unit was added to existing well piping and is housed within the Village of Romeoville’s Lake Strini well-house. In 2008, when the IEPA issued the Village of Romeoville, IL, a Source Water Non- Compliance Advisory (NCA) requesting action to eliminate the bacteriological concerns associated with the well, the Village wanted to stay in compliance with the best solution for this issue. A preliminary UV treatment system was designed and completed in order to work with IEPA to push for the state’s first permanent application of UV treatment for groundwater. A 10-month long process of regular collaboration with IEPA took place in order to gain the support of the IEPA for a multiple-barrier approach to well treatment using a UV dose of 40 mJ/cm2 to achieve 4-log inactivation (99.99 percent) of bacteria. Facing expensive and environmentally unfriendly options to address the occasional discovery of bacteria found in one of its groundwater wells, the Village looked to develop a solution and resolve this issue, resulting in three possible solutions. In order to avoid more extreme measures and save the existing well, a team, comprised of ongoing partners with the Village of Romeoville, Strand Associates and Metropolitan Industries were chosen to develop a plan to effectively overcome the problems at the Village’s Well 3. 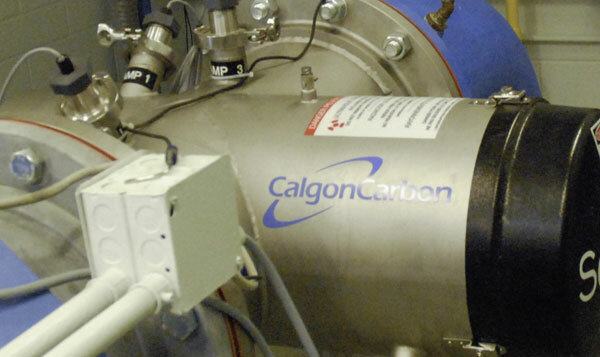 Their collaborative efforts (along with Calgon-Carbon Corporation) resulted in a solution that ultimately became the first permanent and permitted ultraviolet (UV) treatment system for inactivating bacteria in groundwater in Illinois. The shallow well at the Village’s Lake Strini facility had recorded some minor bacteria issues leading up to February 2008. Although susceptible to iron reducing bacteria, which can easily be eliminated with chlorine, the presence of such bacteria served as an indication of the potential for other bacteriological activity in the well. The State of Illinois Environmental Protection Agency (IEPA) typically recognizes the well casing and proper installation as a primary barrier to bacterial contamination. After review of the existing well, it was determined that the condition of the well may not be suitable for consideration as a primary barrier. Since contamination in the well was detected, it is a state requirement that a primary barrier be re-established or abandonment of the well would have to take place. Existing well discharge line was modified to accommodate the new 12” U.V. unit. The UV system design adds a primary barrier to protect the public drinking water supply without any chemical addition. In the event that the well was abandoned, the Village would have had to resort to drilling a new deep well, with well treatment at a great financial hardship to the Village. After reviewing the existing data, the bacterial issue in the well was linked to periods when the well was idle, such as during low water demand or system maintenance. Also having concerns that future well inactivity could result in the same conditions recurring, UV treatment was found to be the most environmentally conscious and cost-effective solution. After the IEPA reviewed this recommendation, the Village received preliminary approval to operate a pilot test to prove the reliability of UV to act as a primary barrier for this well system. The project team had to obtain a final approval from the IEPA for the use of UV in this new application, while also providing the necessary supporting documents, including the specific dosing requirements, which IEPA subsequently has adopted as standards to be applied to future innovative and beneficial UV applications of this type in Illinois. Once approved, the team finalized the design by integrating UV treatment into the existing well house located on the Village’s Lake Strini (Well 3 )property. The design was submitted to IEPA in May 2012 for an IEPA construction permit. Being a new application for UV technology, IEPA and Strand communicated extensively regarding the installation, operation and maintenance of the UV equipment. IEPA approved the construction permit in September 2012. At this time, taking on the role of both equipment supplier and project manager, Metropolitan Industries proceeded with the installation of the UV unit and other required modifications to the existing well house. Working together with the owner, engineer, sub-contractors and equipment manufacturer, the UV unit was successfully installed in the existing well. After demonstrating flawless operation of these improvements for more than four months of pilot testing, the system was put into service and is fully operational as of July 2014. As of the end of 2014 all sets of monthly results continue to validate the operation of the UV system in properly treating the bacteriologically contaminated well. While the project took longer than originally expected, with minimal additional costs than originally anticipated, the Village was very happy with the outcome. Metropolitan shares the engineering profession’s goal to advance its public perception by meeting the public’s expectation to develop cost-effective, green solutions with the public’s best interest in mind. Through collaborative efforts, suppliers, engineers and government agencies should proactively pursue and continue to implement “best-fit” and “green” treatment solutions. Helping to minimize Village costs while protecting the public drinking water supply, this project has provided the best results for all parties involved. 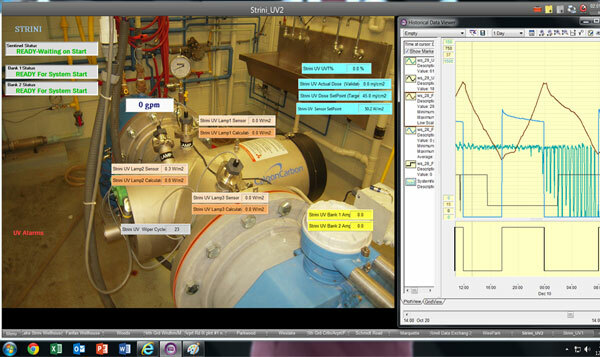 Screenshot from the SCADA system shows real time function of the well with remote access. Pictured from left to right: Candace Scholz, P.E., Strand Associates, Inc., Eric Bjork, Romeoville Public Works Director, Matt Congoran, Romeoville Water Department, Carl Groth, Romeoville Water Superintendent, Chris Ulm, P.E., Strand Associates, Inc., Mike Doretti, Romeoville Water Department, Shaun Farrell, Metropolitan Industries, Inc., Keith Girup, Metropolitan Industries, Inc.
Is Your Municipality's Water Treatment Capabilities in Need of an Upgrade? Metropolitan’s custom engineering allows us to design and factory assemble complete system solutions that are tailor-made for each unique application. Learn more about our packaged water treatment systems and equipped control abilities.